How is the Green Power Juicer Unique? Very little is said about this power juicer on the internet. You will find the most information on this site from a user and a lover of one of the best juice extractor ever invented. I’m not making an over-statement but this awards-winning juicer is really amazing. For a start, the two main features that differentiate the Green Power Kempo from all the other juicers, are its far infrared waves and strong magnetic fields. These ionize the juice extracted in the freshest form with the enzymes all intact. Drinking juices extracted from this Green Power Life Enzyme Activator, will greatly enhance your health in more ways than you can imagine. Read on to find out more. How Does the Green Power Kempo Work? The Green Power juice extractor has a unique triturating twin-gear feature which uses an impeller press system. Triturating means to rub, crush, grind or pound into very fine particles. In this case, to crush, grind or pound the fresh fruits or vegetables finely to extract the juice, nutrients, enzymes and all. The two gears (picture above) rotate inward at about 0.1 mm apart with precision that never touch each other, crushing and grinding produce fed into it. It operates on very low r.p.m. speed that thoroughly crushes and presses fruits/vegetables, producing the driest of pulp and the highest yield in juice. The 0.1 mm pocket-recessed area enables easy crushing of fibrous vegetables and herbs. The manufacturer has also thought of building in three points on the gears that cut strong fibers so that the appliance doesn’t get jammed or clogged while in operation. At the core of each of these rotating gears are in-line magnets that produce a focused magnetic field of a very low 0.42 gauss that can only affect the juices during the juicing process. As the juice flows through this focused field, the water molecules in the juice are broken up to allow the atoms to be recombined with other minerals such as calcium, potassium, sodium and magnesium into new molecular structures. This process maximize the use of the mineral nutrients from the juice and keeps the minerals in a suspended colloidal form that feeds the body for a longer period of time. Even the juice bowl is magnetized at the base to help keep the juice fresher for longer. There is a specially formulated bioceramic material that wraps around the in-line magnets at the core of the twin gears (see picture above). This compound uses the mechanical energy from the twin gears when they are turning, to generate far-infrared waves. These far-infrared waves penetrate the water within the juice, radiate it, and further stabilize the fragile structure of the juice. So, what does it mean to you when we say that the juice is “stable”? This means that the molecules in the juice stay stable for a much longer time, preserving the efficacy of the delicate nutrients when you drink it. It preserves and enhances the taste, color and the smell of the juice. With these two unique technology combined, the twin gears rearrange the oxygen and hydrogen atoms in the water molecules, making them more efficient and effective by extracting more minerals from the produce that you feed into it. Unpalatable vegetable juices taste “less green” and more palatable, but with the precious nutrients, enzymes and minerals still intact and even fresher. And because the mineral content of the juice is increased, it enhances the natural sweet flavor of the juices. Even the texture is thick and tastes “full” because of the concentrated goodies in it. I usually recommend that you drink juices immediately upon extraction, but with juices that you extract using a Green Power Kempo can be kept up to 48 hours in the refrigerator (in an airtight container). This is possible because of the stability of the rearranged molecules that keeps the juice fresh for an extended amount of time. To better explain what I’ve said above, here’s a simple illustration that will help you understand better the wonder of this technology that is not found in any other “leading juicers”. Water, H2O, as we know it is a structure of two Hydrogen molecules and one Oxygen molecule in a sphere. Within this cluster, there are space where specks of pesticide or chemical residue and lead or mercury get trapped. 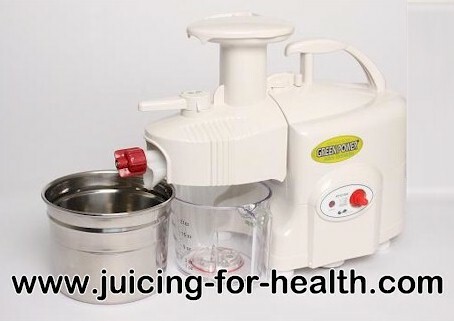 A normal centrifugal juicer that uses a blade, only simply slice and breaking up the cluster but cannot do a thorough job, thus would include the impurities into the juice that you drink. However, when juice is extracted using the Green Power Juicer, the magnetic field opens up the cluster and releases the impurities that are trapped in the space within the cluster. Once opened, the minerals in the produce you juice, attach themselves onto the opened molecules and form new mineral-enriched molecular structure. Now, different minerals such as calcium, potassium, sodium and magnesium are formed into new molecular structures. So you see, these newly formed molecules increase and enrich the quality of the juice that is produced by between 50% and 200%! At the same time, enhancing the taste and rich texture that is concentrated and full with delicate nutrients still intact and more. This gives you your money’s worth, by drinking the highest quality juice that will supercharge your healing process. These are images of a person’s blood being analyzed under the microscope. A sample blood is taken of a person whose body is lacking of nutrients and enzymes. The blood cells are clustered together and moving very slowly. 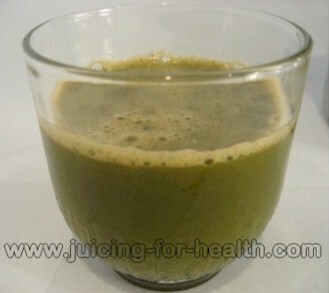 This person was then given to drink a glass of carrot, green apple and wheatgrass juice, extracted using the Green Power. Half an hour later, a sample blood was taken again to be observed under the microscope. Lo and behold, the blood cells separated and was suddenly moving about very actively. The blood cells become active when it receives sufficient enzymes. 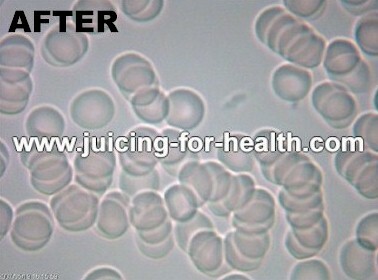 One of the functions of our red blood cells is to carry oxygen and nutrients to all parts of the body. When there is sufficient enzymes present in the blood, the blood cells can do their job properly. You see now, how drinking fresh juices regularly can prevent blood clots which can lead to many health problems including thrombosis and heart attacks. If the blood is toxic and being stagnant or slow moving (caused by eating too much meat and harmful foods, and not enough enzymes from fresh fruits and juices), it causes a sluggish system and create untold ailments: from mild ailments like headache/migraine, fatigue, inflammation (e.g. arthritis, gout) to more serious problems like heart diseases and even cancer. Learn more about what enzymes are and how they affect our general health. Is Your Body Able To Absorb All These Enzymes? I get asked this question: “What’s the good of all these enzymes when your body cannot absorb them all?” Because of the rearranged molecules, assimilation of the juices into your body is dramatically accelerated for you. 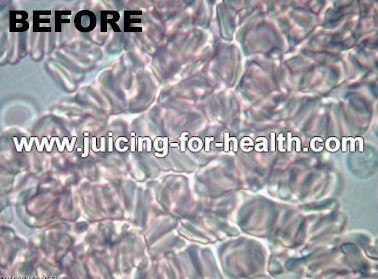 This is why after a while, people get disillusioned from drinking juices using a normal centrifugal juicer. They see very little and very slow result in their health improvement, despite drinking fresh juices daily and faithfully. All this simply because the quality of the juice and level of absorption is very low. What Are The Functions Of Green Power Kempo KPE-1304? This Green Power Juicer officially has eight functions in one. Perhaps one more function than declared in the Alpha DA-900. This is not a big deal as it is basically how each juicer is being marketed. Both can do almost anything the other can do. However, even with all these functions, people who purchase the Green Power Kempo are really mostly serious juicers who use this power machine to only extract juices. To say that it is underused would be an understatement. The quality of the extracted juice alone would have made the purchase worthwhile. 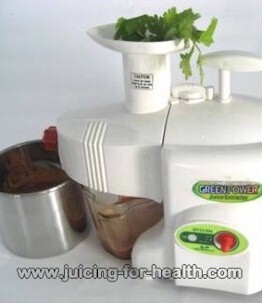 I personally use this power juicer mainly for juicing fresh fruits and vegetables. But, if you are adventurous in the kitchen, the Green Power Kempo is multi-functioned and the things that it can do is only limited by your imagination. This juicer can juice any kinds of fruits from hard to soft. Juicing any kinds of vegetables, including leafy vegetables is a breeze. The pulp comes out so dry that it would easily light a fire. By using the fine screen, the Green Power Kempo can easily juice wheatgrass and herbs with very little foam. The juice yield is also higher when compared to any other gear juicers. Perfect for those who wants to drink juice regularly for healing purpose. Making soy milk is really simple. Just soak the soy beans overnight, then put them through the juicer. Boil the soy milk and flavor according to taste. You save many steps here when compared to the conventional way of making soy milk. Grinds sesame seeds, flaxseed, sunflower seeds and pumpkin seeds. Make your own healthy homemade noodle that is free from preservatives, additives or coloring. This model comes with three noodle nozzles¾two round and one flat. There is also a nozzle to make rice sticks or bread sticks. If you have a toddler at home, you can easily prepare healthy and nutritious food for your child. You don’t even have to cook separately for your baby. Take whatever healthy food you are eating and put them through the Green Power Kempo and you have a quick nutritious meal for your child. Avoid canned baby food that you buy off the shelf in supermarkets. You don’t know how long the food has been sitting on the shelf and they most likely contain preservatives, coloring or artificial additives which are harmful for your child. Now you can make delicious, homemade frozen fruit sorbet, slush, smoothies and fruit ice-cream. As I mentioned, most people hardly use all of these functions, but it’s good to know that should you need to do this or that, you have it all in your Green Power Juicer. And imagine the amount of kitchen top space you save (not to mention the money you save!) by having just ONE appliance with all the 8-in-1 functions. The Green Power Kempo KPE-1304 comes with many extra parts so that you get the most out of your juicing. But there really are only just a few basic parts that would serve you as well. 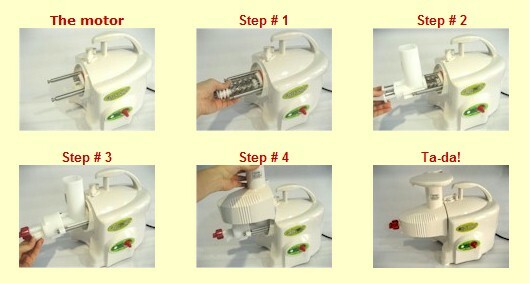 The Green Power Kempo Juicer has a built-in safety device which prevents the motor from overheating. It automatically shuts off when overheated and will commence operation again when cooled down. 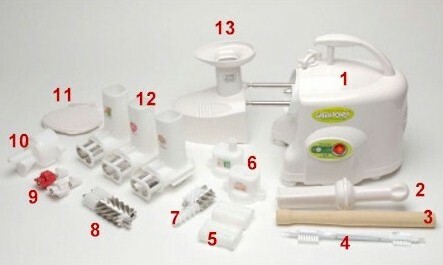 Assembling and dismantling the juicer is an easy 4-step process. Washing up after juicing is a little more lengthy than the other two juicers but still easier than centrifugal juicers. This is a point to consider but can be overlooked for the quality of juice that it produce. The total build-up of the juicer weighs approximately 6.2 kg, less heavier than the Alpha Juicer. 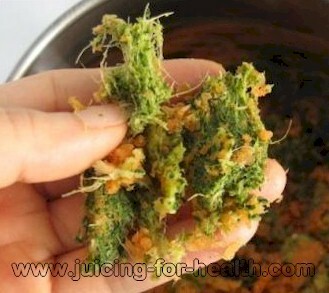 The body of the juicer is made of high quality and food-safe materials that is non-toxic and easy to wash. The manufacturer claims that this juicer is even bio-degradable but I cannot attest to that. How Much Does the Green Power Kempo Juicer Cost? Rest assured you are purchasing a high quality product manufactured in Korea, which has been awarded a string of prizes since 1991. It meets international standards and marks and has also obtained international patents and intellectual property rights for 30 countries across the world. Three-year warranty on motor with technical support by trained and well-equipped technicians. From my experience, if there is any problem, it would usually surface within three months. Once passed this period, the machine hardly gives any problem. Repairs/servicing, if necessary, usually takes only 3 working days. purchase the Green Power Kempo KPE-1304 here. Prices include tax and shipping in Malaysia.